Total War: Warhammer 2’s soggy Curse of the Vampire Coast expansion launches today, introducing vampire pirates, monstrous crustaceans and lots and lots of booty. 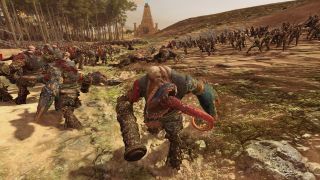 The Vampire Coast factions will be playable in both the Vortex campaign and the gargantuan Mortal Empires campaign. It’s a meaty expansion (crab meat, in case you were wondering) and the nautical vampires are pretty different from their cousins in the Vampire Count factions. They can raise the dead and they’re gross, sure, but that’s where the similarities end. Creative Assembly has really leaned into the pirate stuff. Faction leaders get their own upgradeable ship that functions like a mobile camp, a bit like Total War’s horde factions, but with plenty of special seafaring tricks. Pirate coves can be secretly established in other cities belonging to other factions, siphoning off cash, trade and research. There are treasure maps, pieces of eight to hunt down and loads of competing pirates prowling the high seas. I played around with the campaign a wee bit last night... and maybe a wee bit of this morning. It got its hooks in me deep. I’m looking forward to taking them for a spin in Mortal Empires, but I started with the Vortex campaign. Like the Tomb Kings, they aren’t competing in the Vortex race with the other main factions; their storyline runs adjacent to the others, but it’s separate. All the legendary pirate lords are trying to find verses of an ancient sea shanty that will let them summon a dreadful monster. The goal? Kill the monster and then raise it as an undead minion. Getting to that point requires building up your infamy level by beating up other pirates and generally being naughty. There’s even a pirate leaderboard because of course there is. They are a vain bunch. Tom’s been on the high seas, as well, so keep an eye out for his impressions later today. It sounds like he’s been enjoying himself.